One of the highlights of my journey to the Havana Biennial was getting to visit with Senator Udall and Jill Udall who came to show their support, along with congressmen, Grijalva, Franken and Larson. They came to the Pabellon Cuba exhibit hall for a preview of our exhibit, Between, Inside, Outside, and gave a little talk to the public. Then the electricity went out in the entire hall and they were not able to see my installation and other electronic pieces. 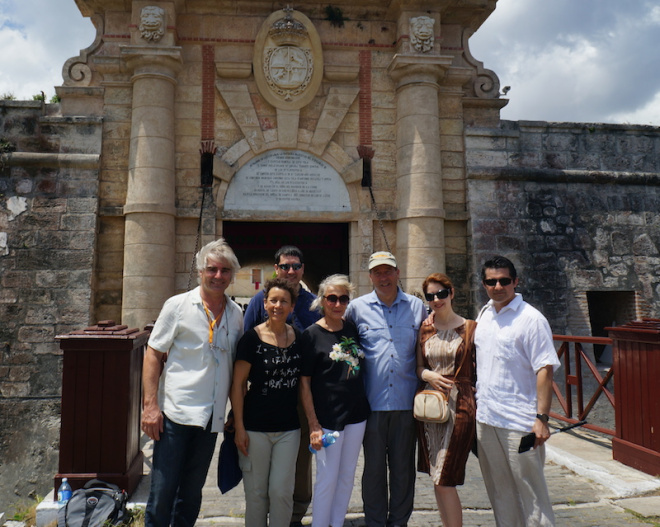 In the Cuban spirit that we came to know after just a week in Havana, the curators continued unwavering with the tour. Each artist gave a lively talk about the work as best we could and the Udall’s will have the opportunity to see my installation when it comes back to New Mexico. That evening, the curators Royce Smith and Dannys Montes De Oca, held a wonderful dinner in old Havana for the artists and congressional delegation. The food was excellent and it was a wonderful celebration of our successful inauguration. The next morning Senator Udall and Jill invited us to see some art with them and we had the pleasure of joining them for a tour of the Zona Franca exhibit at the Morro-Cabaña, one of my favorites site at the Biennial. If anyone is planning a trip to the Havana Biennial this is not to be missed, along with our exhibit, of course, Between, Inside, Outside in the Pabellon Cuba. Thanks again to the Udall’s for always being there to support local artists and in particular for this unique cultural exchange between US and Cuba at such a pivotal time in our history.